Specialized has revamped its popular Allez aluminium road bike for 2016 with aerodynamic features inspired by its Venge carbon aero road bike. 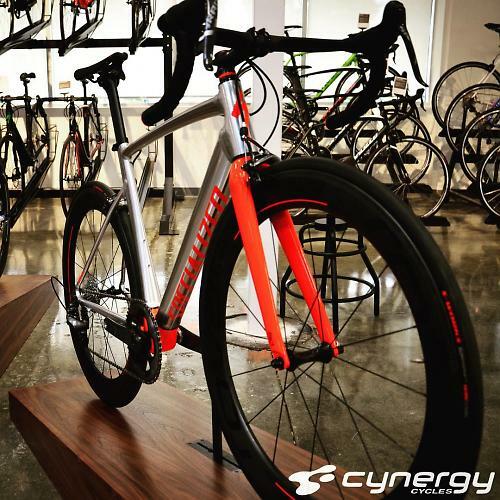 Photos from a US Specialized dealer launch, shared by two US bike shops on social media, have revealed the new design direction for the latest generation Allez. This new Allez Sprint is also the first new road bike we’ve seen equipped with SRAM's brand new 1x11 drivetrain. SRAM ported its 1x11 drivetrain from mountain biking (where it's been a huge hit) and which ditches the front mech and second chainring and brings in a super wide ratio 10-42t cassette. SRAM reckons crit racing is ideal for its new drivetrain, and it's clear that is the sort of riding Specialized has designed this new model for. It also appears that Specialized has modified the geometry of this new Allez, making it more aggressive. That would suggest Specialized has focused this bike very much on racing. It’s not clear if the rest of the Allez range will also follow this change. This new Allez is constructed using Smartweld, a technique only used on the more expensive Allez models, and promises a lighter and stiffer frame. Smartweld uses hydroformed main tubes paired with a specially forged head tube. “The headtube, toptube, and downtube have been hydroformed with a curved, dome-like edge that, when butted together, creates a seamless valley that is filled with weld material,” says Specialized. And that’s about all we know at this stage, we don’t yet have any more concrete details about the new bike or the range of models that will come to the UK, but we’ll hopefully find out more soon. What is clear is that there is plenty of life left in aluminium still, and it's good to see big brands like Specialized investing in high performance aluminium. Photos reproduced with kind permission of Surf City Cyclery and Cynergy Cycles.